My KORG “MiniLogue Midi Editor” is a Midi Editor /Controller for the popular Synth “MiniLogue” . It`s a Remote and Sound Editor. 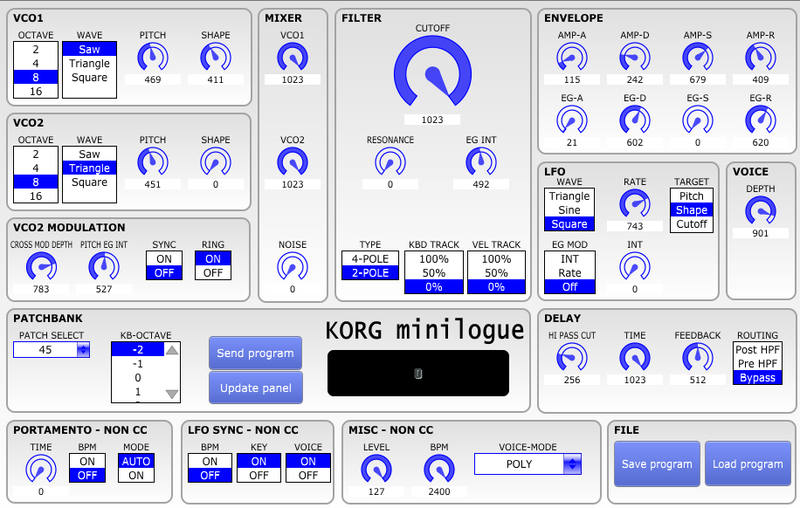 You can select the sound off the “MiniLogue” (Factory- and User -Bank ). The parameter can be changed on the “MiniLogue Midi Editor”, and stored on MiniLogue Hardware. This is a panel for the Korg minilogue polyphonic analog synthesizer. All CCs are implemented. Current program can be requested from synth, is stored to panel state and can be send back to the device. This works only with MIDI-to-USB drivers. Current panel state can stored as syx file to filesystem and syx dumps can be loaded from file into the panel.